Besides having protective effects against heart diseases, Co Q10 supplementation also helps increase energy levels. However, Co Q10 Level in our body decreased with aging affecting our health adversely, hence experts recommend supplementation of Co Q10. CoQ10 supplementation uplifts heart health and imparts protection against heart disease and enhances your energy levels. 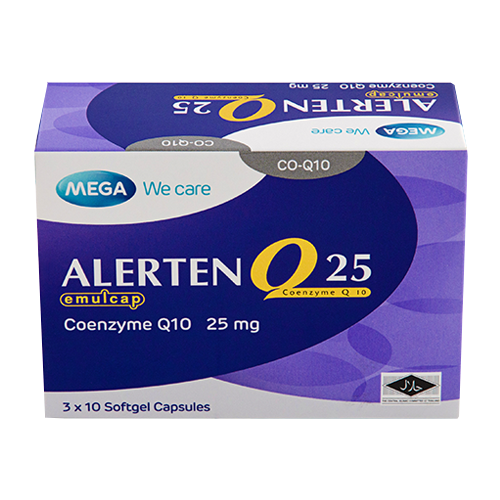 AlertenEmulcap, a CoQ10 formula contains a superior, pharmaceutical grade, natural transform of Coenzyme Q10. Alerten provides energy to heart muscles and other organ tissues. AlertenEmulcap has been proved to have better absorption and bioavailability as compared to the conventional soft gelatine capsule and other products in tablets and hard capsules. 1-2 capsules 2-3 times daily. An adjunctive therapy to standard treatment in patients with congestive heart failure, treatment of periodontal disease and prevention of Coenzyme Q10 depletion in patients taking HMG-COA reductase inhibitor.